- Mac is stuck on this "cutting edge" theme. Its the buzzword amongst his staff. Our communications director says on her blog that our new logo is "cutting edge". Well, we might be trying to be "cutting edge", what ever that is, but contrary to what Mac says our church was not cutting edge. We just looked for ways to teach the bible, and proclaim Jesus, and get people saved. That's all. The secret is there was no secret. What God did in "the miracle of downtown Jacksonville" was not manufactured by man trying to be cutting edge. God did a miracle in Jacksonville as we were led by called preachers who just preached the Bible, with people not having any seminary training or "certificates" but love for Jesus and knowledge of the Bible teaching and applying the Bible in Sunday School. Our "cutting edge" was people devoted not to a preacher, not to a program, and not even to the church (no need for calls for the "churchmen" to rise up) - but people devoted to Jesus Christ. - I don't fault Mac for starting certificate programs at our church, or desiring for Sunday School teachers to have more Bible knowledge through formal training. But those who sat under the preaching of Vines and Lindsay where the Bible was preached Sunday morning, Sunday night, Wednesday night, and on Sunday morning in Sunday School - after a year or so people HAD MORE BIBLE KNOWLEDGE THAN MOST PEOPLE COMING OUT OF SEMINARY!!! The people of FBC Jax had so much knowledge of the Bible because our preachers weren't giving us history lessons - they really did preach the Bible every single Sunday. And our Sunday School teachers taught us lessons that WERE application...we didn't need to huddle in small groups and ask each other how a verse made us feel. - Homer Jr. was a called preacher. Never said he wanted to be a lawyer, or that he was smart enough and had the drive and ambition to be successful outside the ministry as Mac as proclaimed of himself. He was a preacher in North Miami when his dad asked him to pray about coming to serve as co-pastor. Homer at first refused, but eventually he did come. Not to a $300k piece of land and 5000+ square foot home in Deerwood, not to have a huge pastor's office suite built, not to put Ms. Shirley on staff. Not to preach sporadically to finish his book manuscript (unlike the millionaire preachers today, Homer declared that nothing he ever said or did or wrote was copyright worthy, since God can't be copyrighted). He didn't come to raise money to put himself on national TV or hold "Time to Stand for Israel" events. He didn't come either to advertise in our bulletin "Holy Land Trips" for the very rich to travel to Israel. He came to get busy in doing local ministry, and in the first 3 years of his ministry the Sunday School attendance doubled. And Homer doesn't brag, he acknowledged over and over: it was all God's doing, nothing manufactured by man, no "theology driven ministry"...no dynamic preacher, no history-laced sermons - all a miracle of God. - Quite interesting that Mac mentioned that the first building program after our church got out of debt in 1943 was what is now the 6th Grade Building. Mac says that Homer Lindsay, Sr. borrowed $350,000 to build that building. Why bring that up? Because I predict this is Mac signaling that he will be leading us to go into debt again. What Mac doesn't understand is that for the past 60 years God's people built the buildings at FBC Jax as they saw God moving, and space was needed. And the church used the moving through the people giving as a sign it was time to build. And the people's tithes and offerings were used to maintain our facilities. We didn't spend money on high-priced preachers and national TV time and then took special offerings for maintenance of the facilities. - Mac again couldn't help but to continue his abusive preaching. Had to knock us for not amening enough on one of his excellent points. And he has never yelled at us more forcefully than he did Sunday about older men helping younger men see what God has done in the past. Only problem is that Mac spent his first two years telling us to NOT dwell on the past, that successes in the past have nothing to do with successes in the future - but now he screamed at the top of his lungs that we should help younger people look to the past...followed with a "Did you hear me? Is that clear? All right." as though he were talking to a rebellious teenager. That is abusive preaching. Enough to scare little kids causing them to ask "why is that guy so mad, Mommy?". From this sermon I get the sense that Mac views himself to be another Homer Lindsay, Sr. Now that I have learned Homer, Sr. was going to be a lawyer until he was called to preach, it makes sense that Mac is saying that now too! Mac views himself in the same position as Homer Sr. in 1940: he has come to save a dying church as Homer Lindsay, Sr did in 1940. That Mac sees a parallel between the $1 million in needed repairs and the debt Homer, Sr. had to retire in 1943. And that Mac will have to start a building program, perhaps borrowing money, just like Homer, Sr. did in 1943. To quote Lloyd Benson in 1988: "I knew Dr. Lindsay, Dr. Lindsay was a friend of mine..."
Lastly, at the end of Mac's sermon, a glimmer of light. Mac let's us know the Lord spoke to him that he needs to let God handle the needs for the money - what a novel thought - how 'bout if Mac trusts God, trusts the Holy Spirit to move in the hearts of people, instead of beating people up with guilt and fear to motivate them to give. Its a little too late...after beating us up and not even bothering to mention the New Testament plan for Christian giving or calling on people to give out of love for Jesus, its just a little too late. Mac will be on vacation for a couple of weeks. Let's see what the Lord does with him while he's away. Readers - I want to share a few thoughts on Mac's sermon Sunday entitled "And the Iron Did Swim". Mac on our Chest of Joash Sunday 9/28 reached back into our church history and preached on the same scripture, II Kings 6:1, that the Lindsay's often used over 60 years to recount the history of miracles at our church. Listening to Mac's sermon, which I found quite empty and uninspiring, has caused me to reflect on the question: what is the difference between Mac's preaching "The Iron Did Swim" and the Lindsay's preaching? What made the Lindsay's preaching so powerful? Its quite an appropriate question to ask ourselves at this point, given that Mac has decided to use this scripture and sermon title from the past. Mac's sermon was full of interesting history of our church and references to Homer Lindsay, Sr. But to help understand the difference between Brunson and Lindsay I went back and listened to Homer's sermon from sometime in the early 1990's - most of the members have this as it is in the "Best of Homer, Jr" tapes we received in 2000 when Dr. Lindsay, Jr. died. I recommend that readers who have access to this sermon listen to it again. - Homer oft used the "The Iron Did Swim" sermon to express thanks for the many miracles that God did and was doing at our church. Very positive. Homer would go over the miracle of our youth ministry, of our men's ministry, of souls being saved, people loving Jesus and their community. Always Homer acknowledged these miracles were 100% God miracles, not man-manufactured miracles. Contrasted with Mac, who on 9/21 preached a sermon to showcase all that he and Smyrl have done through the theology driven ministry - all the wonderful things Mac has done (e.g. Shelly B: "Thank you Dr. Brunson for theology driven ministry..."). 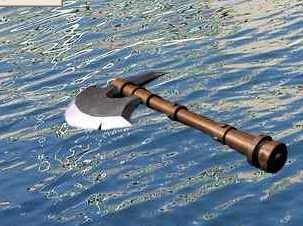 On Sunday 9/28 Mac turned the "Iron Did Swim" sermon on its head, to use the scripture to accuse us of losing our "spiritual edge" (whatever that is) as a metaphor for the axe head falling in the water...and at one point said we should "...pray to get God's spiritual edge back in your life." OK...so let's all pray: "Dear Lord, we pray to receive our spiritual edge". - One of the very striking differences in the preaching of Homer and Brunson is: JESUS. Mac again Sunday barely mentioned the name Jesus. Just twice. Homer's sermons in general, and his sermon on "The Iron Did Swim" he mentions Jesus over and over. Love for Jesus. Love for souls accepting Jesus. A lighthouse for Jesus Christ. - Homer loved his people. Oh, he preached hard. But Homer recognized that in his large congregation there were people at all different spiritual levels: some very committed and mature, some new Christians, some back-slidden, a few recalcitrants and some wolves in sheep's clothing. But the difference: Homer AND Vines preached the Word, always in love but in truth, and they let the Holy Spirit do the convicting. Mac just preaches hard on people, at times twists scripture to intimidate and instill fear - as though he doesn't trust God's word to be fitted to the many different spiritual hearts in the congregation. No doubt Homer loved his people. - Another striking difference is root of the motivation for all that is done at FBC Jax. When Homer and Vines preached about giving and serving, it was to motivate us out of our devotion and love to Jesus Christ first, and out of love for our neighbors and friends second. Mac once again Sunday as he has done since arriving, tries to manipulate people to give and serve out of fear, out of duty and obligation to Old Testament scripture, and out of devotion to an institution (FBC Jax). Mac does not try to motivate people out of their love for Jesus. Why? I don't know. Perhaps Homer understood that the greatness of the church was in its people loving Christ and responding out of love, whereas Mac and Smyrl believe success is gained through legalism, through man's ideas and actions, and a well-structured "cutting edge" program like Theology Driven Ministry. Homer trusted his uneducated leaders to preach the Bible in Sunday School. I have more to say about some of Mac's antics on Sunday, how we knew Homer was a God-called preacher, and a few other insights as well as some audio clips of Homer and Brunson. If you have thoughts you'd like to share about the sermon Sunday, or about Homer Lindsay Jr. or Sr. that you might have thought of after Mac preached about our church history, chime in here! Pie Charts and "Giving Units"
How does Mac choose to motivate his sheep to give to the Lord's work? Not by teaching the New Testament principles of giving. Never once in his two-week series on stewardship did he present the New Testament principle laid forth in 1 Cor 9:6-7. He didn't even bother to make his case for the legalistic teaching of tithing. I noticed he wasn't quoting John MacArthur on the issue as he does most Sundays, as John MacArthur knows that the Old Testament practice of "tithing" is not applicable to Christians today and to hang the legalistic yoke of tithing on Christians is unfair and unscriptural. "You spend 24% of your salary on housing...you spend 22% on recreation and pleasure, that's amazing...we spend 19% on healthcare...we spend 17% on our cars...and 15% on food...under 3% is what you give to charity. You're not going broke because of the church. You're not going broke because you're giving something to the church." "If we've got 5000 giving units in this church, if we make on the average $50,000 that would be $25 million to the church and we're struggling to meet a budget between $15 million and $16 million. If everybody gave a tithe we would never have to mention the issue again." Sounds like a good Amway pitch. Yeah, right. If we had given them $20 million Mac would have spent it and would be holding his hands out for more, trust me on that. Poor Mac, he had to "get by" with just $15 million when if his stupid sheep weren't spending so much money on entertainment and cars, Mac WOULD have had $25 million! Mac sure doesn't sound very grateful does he? And yes, Mac views us all as his "giving units". Hear that southern Duval County? Mac is counting up his "giving units", and make no mistake, he wants you to go to bible studies at our Life Link homes so he can get you and your giving unit over to the satellite. Once they do the "bait and switch" by drawing you into a home Bible study and moving you over to a "satellite church"- once you're there you'll be taught the legalism principle of tithing, that you are required as a member in good fellowship, to fork over 10% of your income to Mac Brunson. Yes, you people over at someone's home, you will be expected to give 10% of your income. Listen to Mac say it right here. We'll take that tithe you give not for your local satellite church, but it will come back to the FBC Jax coffers downtown so Mac can do what he wants with his school, give Maurilio a raise, and other "special projects" that Mac needs. "For God so loved the giving units...." and "The giving units did swim"....some great stewardship sermons in there somewhere. And in the divisive Brunson way...Mac makes the case that either you tithe or you're "out of fellowship" and if you're out of fellowship, its "obvious". "Now I realize preaching on this makes some people uncomfortable. And that tickles me to death. You don't know how I enjoy that, maybe too much, maybe that's a little bit flesh. But I want to tell you something. Those of us who tithe don't mind hearing about tithing. Those who don't get uncomfortable. But I want to tell you something, it's Biblical....Church, let me tell you something...we will tithe, we will give...the church is made up of people who made a resolve under Jesus Christ that we will have certain things in common...one of the things we have in common is we're going to give and support this ministry. And that makes some people uncomfortable because they're not part of the fellowship. They're out of fellowship. They're out of fellowship. And its obvious." So give, tithe, because if you don't you will be out of fellowship, and we'll note it because its so darned easy to spot you recalcitrants. Mac Brunson's sermon Sunday September 21 was a classic sermon that characterizes perfectly his first 2 1/2 years at our church. It had it all. It was full of half-truths, misuses of scripture, attempts to persuade not through the truth of the Word and prompting of the Holy Spirit but through coersion and guilt. 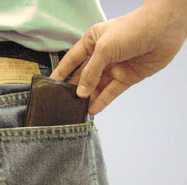 Mac did all he could to get his hand on your wallet this Sunday - only problem is he has a problem with the truth. Mac admitted early in the sermon he didn't really want to preach that morning - perhaps he should have stuck with his gut feeling and spared us the ensuing abuse that was about to come. 1. The Church in Rome was a Group of Satellite Churches: Mac again this Sunday told his congregation that the churches in Rome were really a group of "satellite" churches. If by that he means "satellite" in the way we use that term today, he's a liar. There was no mother church that the churches reported to. The churches in Rome met in people's houses. There was no rock star preacher who went around preaching to them. In fact just the opposite: the case can be made that the collective churches were "autonomous" churches and certainly not "satellites". But Mac thinks enough of his sheep are biblically illiterate that he can make them think his plan for satellites is directly from the scripture - just by saying it. But I've shown multiple times that Mac plays loose with historical facts and scripture if it suits his purposes. This is a classic example of that. But his sheep are smarter than he thinks. 2. You Should Keep Your Commitments: Mac showed what a hypocrite he is by again this week lecturing us on how we should be keeping our commitments. "When you make the commitments, you stick with the commitments" he proclaimed. He said it once, and got no response from the congregation...so he repeated it again...and then again until he got a smattering of "Amens". Only problem is he should be preaching to himself. He embarrassed our church by not keeping his commitment to attend meetings of the Crime Prevention Steering Committee set up by Jacksonville Mayor John Peyton and to which Mac committed to attend. So who's not keeping their commitments? 3. Mac Says Not to Use Your Gifts in the Community, Only in Church: Mac proclaimed that Christians have a responsibility to use their gifts not in the community but in the church. 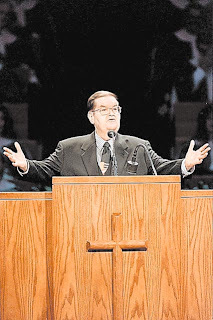 In Mac's mind, the world starts and ends with First Baptist Church of Jacksonville, that any good that will come to Jacksonville must be through his church. At least he's consistent: he says we should only be serving in church and not in the community...and so very little of our church budget goes to helping the needy in Jacksonville - in fact many more times the annual FBC Jax budget that goes to helping our community goes to paying Mac and family their salary. 4. Mac Says Inlight Ministries is the Preaching Ministry of FBC Jax: He says several times "he gave this ministry to the church" and that Inlight Ministries is the "teaching ministry of FBC Jacksonville." That's a lie. Its his ministry. Its the teaching ministry of Mac Brunson, not FBC Jacksonville. You say "what's the big deal?" It shows how disingenous Mac is. When Mac left Dallas, he brought this ministry with him because its HIS ministry. When he leaves FBC Jacksonville, he will take that ministry and the programming brand equity that the hundreds of thousands of dollars from our church have purchased, with him to his next endeavor just as he did when he left Dallas. When he says he "gave" this ministry to us and its "our ministry", he means that money coming in to the ministry goes to FBC Jax to buy air time - OF COURSE IT DOES! It would be scandalous if it did NOT, since our church members funded the INSP program costs! If this is our ministry, then he can shut down his http://www.inlight.org/ website. But Mac has come under pressure for taking hundreds of thousands of dollars of money from us to broadcast HIS sermons on INSP network, so his response is to tell us that its "our" ministry when it is NOT. Most megachurch pastors have their own websites. The sermons they prepare and preach are their own intellectual property and they can make them available on their websites. Not a problem. Robert Jeffress who replaced Mac Brunson at Dallas, has his own ministry called "Pathway to Victory" separate and distinct from the ministry of FBC Dallas. And if the church decides to contribute money to the pastor's ministry to help fund his broadcast, and its communicated to the church and its in the budget and the church votes on the budget, great. But look at how Mac does it: he has his ministry, he wants to be on national TV like his fellow mega pastors, he holds a special offering on the largest attendance Sunday of the year to put his ministry back on TV, he gets back on TV using money from FBC Jax, and now he is telling us that its "our ministry" and not "his ministry". This is Clintonesque parsing of words. He did the same with the "Time to Stand with Israel". He told us "we're not sponsoring it, we're just hosting it." 5. Mac Proclaims to Know what the Lindsays Would Say About Satellite Ministries: Very interesting that Mac proclaims to know what two men that he never met, Homer Lindsay Sr, and Jr, would say about his plan to start satellites. Its likely that neither would be in favor of a satellite church that Mac has planned, but might be for a church plant. But whatever the case, can't he stand on his own and make the case himself for satellites? Must he lie about churches in Rome being satellites, and telling us that our deceased pastors would be for it? He has yelled at us as always looking to the past and worshipping previous pastors, but when it suits his purposes he not only looks to our previous pastors, but presumes to know what they would say when he never even so much as shook their hands in his life. Interesting that he only tells us what the dead pastors would say...I wonder what Vines would say about satellites? 6. Mac Calls Those Who Don't Serve "Blackmailers" and "Sinning Against the Holy Spirit": Mac is a divider. If there are people in the church who aren't serving in any official capacity, he doesn't appeal to them to serve out of love for Jesus, or to give of their time to serve out of love for their church or fellow church members...but out of guilt. And if you don't serve - then you are a "blackmailer" and you are "sinning against the Holy Spirit". No scripture to back up his claim. Doesn't have to. In Mac's church, if he says it, then it is so. Our pastors warned us of this kind of abuse - they have always told us to measure words said in the pulpit against scripture..
7. The Group That is Not Happy About God Moving in Our Congregation: In Mac's church, if you're not fully behind Mac, you're against him and against God. Mac refers to those in our church who are not happy about God moving in our congregation. Again, Mac's attempt to divide his church - be happy about what he wants, or you're against God. Mac loves to do this with his opposition: instead of dealing lovingly and gently with those who have concerns with his leadership, instead of addressing directly concerns that people have, he instead mischaracterizes them as being "not happy about God moving" in our church, and thereby belittles them and can conveniently ignore their legitimate concerns. Classic Mac Brunson strategy. In the next article we'll look at Mac's legalistic approach to motivating people to open their wallets and give to his church. - I have a few posts that I will be making this weekend as we get ready to be fleeced by Mac Sunday, so please stay tuned over the weekend. Readership of this blog is increasing, and more people in our congregation are opening their eyes to the abuses of Mac Brunson at our church. Granted, these abuses are not gross moral abuses like a Gilyard or Gray perpetrated at their churches and thus they won't ever gain media attention, but they are abuses nonetheless that the church should be on guard against. Many of the abuses we are facing we were warned about by our previous pastors. - Don't be afraid to pass this website on to others in our church. We need more people to begin to think deeply about what is going on at our church. Its no coincidence that our pastor has been using Sunday sermon time to express his concern about "what you all are reading" and expressing that he thinks we are gullible enough to be led away. The pastor doesn't want people to read this blog that shines light on his actions and words because he knows the end result of people thinking about what they are hearing and seeing at their church. - As I said in my previous post, one of the insidious actions taken by the Brunson regime and his band of trustees, was the unexplained bylaw changes that took power away from the congregation and gave it to the mostly rich lay leaders appointed by Mac Brunson. But I do declare, they can pass all the bylaw changes they desire, and grant themselves all sorts of power to exert their will in the church. But I want to remind the readers of this blog: the power will ALWAYS belong to the congregation, because the power the leaders have is derived from the willingness of the people to give. - Mac knows this is true - that is why in his two stewardship sermons his methods to get you to give to the church were guilt, obligation, right fellowship with the church, tradition, and words of dead pastors. He never put forth the New Testament principles of giving, and to make it worse, he didn't even bother to make a biblical case for tithing but misused scripture pointing to Romans 13 - believers giving a special offering to help poor believers in another city - as justification for us to tithe when that scripture had absolutely ZERO to do with the biblical principles of tithing that Mac has legalistically taught since arriving. So I implore you to NOT give money to the special offering. Mac admitted that we met the budget needs of the church, and that we are $800,000 below budget on expenses. The church has the money, or they can get it in the next fiscal year by better budgeting. I also ask you to consider reducing your giving to the church - this is the only way you have to take the power back from the pastor and his trustees that stole it from us last December in the bylaw changes. Furthermore, don't be afraid to pass this website on to other believers so they can get another side to the FBC Jax story than the lies of Mac Brunson. Stay tuned...I'll be writing about the many lies of Mac Brunson in his 9/21 sermon which was chock full of legalism and lies. As Mac sharpens his sheers to fleece us all this Sunday, let us gullible sheep indulge ourselves to look to the past to see what Mac has done to our church in terms of leadership, decision making, and financial expenditures. Mac is a man who never met either of the Lindsay's, yet when it comes time to whip the sheep for money he loves to proclaim to know what the Lindsay's would say or do. How convenient - he tells us to not look to the past, but he loves to look back when its convenient for him - like when he tries to hang the yoke of legalistic tithing instead of teaching New Testament giving. So we shall take an honest look backward at the past as the clippers are warming up. Mac's sermon (infomercial) Sunday was a hurried attempt to try to paint Mac and Smyrl as innovative leaders in our church - as though they have ushered in a new day with "theology driven ministry" - as though we were previously "comic book driven ministry" or something else...but don't be fooled church. There's another side to Mac's story. That is the side that Mac has hijacked power at our church to himself to do what HE wants, irrespective of what his congregation, which is a royal priesthood of believers at FBC Jax, believes should be done. Its been almost 3 years since the end of the Lindsay/Vines era at our church, and as time passes and we are exposed to the Brunson regime week after week through his abusive preaching its very easy to be become numb, to forget what the leadership and decision making principles were that made our church great. Don't listen to Mac when he proclaims to know what Homer Lindsay Sr. or Homer Lindsay Jr. would do - as I said he never met either man, and he is very ignorant on the history of our church as evidenced by him thinking we were "cutting edge" in years gone by. 1. The "Priesthood of the Believer" was recognized by the Congregational Rule form of leadership in our church and our bylaws. Our pastors and lay leaders have long understood that our church was governed by "congregational rule", under the biblical principal of the "priesthood of the believer" in 1 Pe 2:9. When a decision was to be made that required special funding or capital funds, a vote was taken before the money was spent. The vote was announced, and it was genuinely taken in a regular, or previously announced business meeting. If the congregation did not approve it, it wasn't done. The pastor has assumed sole responsibility to appointing trustees of the church, and the finance committee was disbanded and made part of the trustees, appointed by the pastor. Mac has repeatedly demonstrated a low view of the members of his church by constantly accusing them of not reading their bibles, not supporting the pastor, and his low esteem of his congregation was evidenced by his failure to distribute the bylaws prior to the vote. He has spoken ill of our congregation away from our church on multiple occasions, further evidence of his low view of the sheep he was called to pastor. 2. The Pastoral Authority in our church was something that was earned by the pastor, and voluntarily given by the congregation. This moral authority was not something demanded by the pastor as a function of his position - it was granted to him by our congregation. He didn't use his power to lord over us and beat us, or to be a dictator and demand we do what he does without a vote or before the money is given. We willingly followed their loving leadership based on years and years of them demonstrating to us that they walked with Jesus, and that they loved the church and had the best interests of the church and the community. Mac came in from day 1 behaving as though he should have the same moral authority granted to him as a function of his position as the new "Pastor" at our church. This was evidenced by taking a salary as large as previous pastors, practicing blatant nepotism by putting wife and son on staff in newly created positions , and having our church spend $100,000 and using 3000 sf of prime Children's Building space for a lavish office suite. Its good to be da king. Even accepting the $300,000 land gift and a year's rent free stay at an ocean front condo as he did three weeks after arriving in Jacksonville send a signal that he believes himself worthy of such an honor as receiving a 6-figure gift based solely on his position, not his sacrifice. He should have politely refused that gift and urged the man to use it for the Lord's work, not to enrich the pastor. Instead of Mac coming in here and getting busy to preach and roll up his sleeves and work hard and love us, he took 2 months with pay to arrive, sporadically preached his first year, vacating the pulpit on Sunday mornings and night without letting his congregation know, sometimes by his own admission he could work on his book manuscript (the book where he counsels pastors not to accept large gifts or live in "executive" homes) began using our church to advertise for his Holy Land trips, etc. Mac embarrassed our church by not keeping his commitment to serve faithfully on the Mayor's crime prevention steering committee. In short, Mac came in as the "rock star", not as the new humble preacher coming to build good will with the people. 3. Decisions were voted on by the church, after the pastor presented the plans and asked people to pray and to give. When the pastors determined what major direction they believed the church should go in, they brought it to the church and clearly communicated it - why it was necessary, how it was rooted in scripture, and they asked us to pray. If it required capital funds (as many decisions did during our high growth years), the financial needs were communicated, and the people were asked to pray and give as the Lord moved. When the funds were raised and we were ready to launch, a vote was taken of the congregation to spend the money. Our church historically has used the people's willingness to give as a sign that the Lord was moving in the church. The pastors did not go into debt for several reasons, one of which was they knew that if the Lord was in something, at least as God had moved in our church for decades, then God would move the hearts of his people to give the money needed! It wasn't just a desire to stay out of debt; but the pastors trusted the people to give as evidence that God was moving. Because of his low esteem for the people of God, that we don't read our bibles, we don't even bring our bibles, and we're a bunch of legalists with "no real relationship with Jesus Christ": because of this, the congregation must be told what to do. After Mac tells us what he wants to do, then he builds a case to convince us that its a good idea. For those who might disagree or don't respond as he asks, he will mischaracterize or minimize their concerns from the pulpit. Case in point his anger at the church for not being behind totally behind the satellite concept. He'll use guilt to try to convince people to go with him. I have blogged about many instances making the above case. The latest one I will point to is the decision to start a school downtown. Mac wanted a school. He believes that it is necessary. He lied to us and said that knocking on doors doesn't work, and thus, we MUST start a school if we're going to reach Jacksonville with the gospel. That's a lie out of hell. Its not a requirement to reach our city. But Mac wants it. An endeavor like that takes start up costs...to the tune of $500,000. So what did Mac do? Well, I can tell you what Homer or Vines would have done. They would have communicated the vision, and asked for people who were behind this vision to give to a fund. When the money was raised, a vote would be taken to start the school and spend the money. What did Mac do? He held an unannounced business meeting to vote to take $500,000 from our church funds, money given by God's people to the ministry of FBC Jax, to start the school. Shameless. And as further evidence of how stupid he thinks we are, he holds out his hand for $1 million in maintenance costs when these should have been taken care of when he first came on board, or certainly before spending money on pastor office suites, INSP broadcasts, and start-up of a school for the very rich. And now that we don't have the money we should put it in the budget for next year. 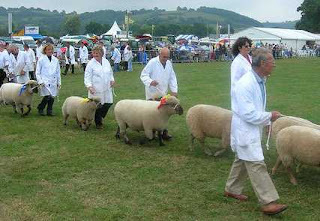 But the sheep will give deep...and Mac will receive a hefty Christmas bonus for his wise and able leadership. And Smyrl writes his "Theology Driven Ministry" book. 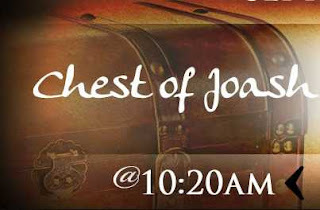 Like most of you have I'm sure, I have received Mac's annual "Chest of Joash" letter telling the church about our special budget commitment Sunday that we've held at our church for over 50 years. But in his letter this year, he has included a list of "emergency" spending items for which he is asking our church to give a special, one-day offering of $1,000,000 dollars to. Yes, he uses the word "emergency" to describe this list. 2. Preschool Building Roof Replacement - $250,000 - been on the repair list for 5 years, hardly an "emergency" as we've know about this for a LONG time. 4. Preschool Wall Paper replacement of $60,000 - caused by failure to act on number 3. above. 8. Children's Building Renovation for the new school admin offices - $125,000. I wonder what Mayor Peyton and Councilman Davis, both who expressed disgust over "sorry churches" who don't use their money to help the poor and needy here in our own community, will think when they hear of this letter asking for $1 million in a special offering. Not $1 million in hurricane relief. Not $1 million for a new ministry to the poor in our city, or even for a new capital fund for ministry (THAT will be coming in the spring, so hold on to your wallets). Not even a million to catch up on giving that is behind budget. No, our church is holding out its hand at the end of its fiscal year to pay for REGULAR ON-GOING MAINTENANCE OF OUR FACILITIES because we didn't budget this maintenance into our $15 million budget the past few years that according to Mac that according to Mac the faithful people at FBC Jacksonville have met! So while we're spending money and rushing as fast as we can to start a satellite church in southern Duval, and while we're spending money to start a downtown school for the very rich, we have not spent money to water-proof and re-roof the building where our preschoolers and babies are. Interesting isn't it that we found the $100,000 and 3000 sf of prime ministry space needed to construct a lavish pastor's suite and library, but now no money was found the last 3 years to keep water from seeping through the roof and walls of our preschool building! Interesting that while we somehow found the money in the budget to hire wife and son in new positions, and we from somewhere found the $180,000 to put Mac back on nationwide TV there is no money for our chiller to be replaced in the RLA. And while Mac was taking a $300,000 gift from one of our wealthiest members and immediately began construction of his million dollar home in Deerwood, the Admin building was in need of new carpet and the RLA needed roof and ceiling repairs. Misplaced priorities. Misplaced spending priorities on the part of Mac and our lay leaders does not constitute an "emergency" on our part. I know Mac's sermon/infomercial yesterday was designed to tell us just how wonderful his leadership has been but he can't mask the utter failure to not have taken care of the essentials of our maintenance using the $15 million we gave this year to the budget, while holding special offerings for extra ministries and holding unannounced budget meetings to take $500,000 to start a school for the very rich. "The number one false financial thought: 'We need to make more money'. THINK ABOUT IT! If you make more money spending the way you spend now you would be deeper in debt. Thank Jesus he hadn't allowed you to get a raise. He has saved you from getting further in the whole. The issue is not more salary, the issue is discipline. Have you heard that word in America lately? The government would do well to look it up in the dictionary." So easy for a millionaire preacher living in a million dollar home to say something like that to his congregation, many of whom are being squeezed by a tight economy and rising prices. Well Mac, we'll tell you there at the church like you told us: the issue is not that you need more of our money, the issue is "discipline". Cut expenses somewhere Mac. You said yesterday our spending is under budget and we're in the black...great, cut a little more and we'll have the money you need. Don't be like the government who wants to raise taxes when there's a short-fall - try fixing it on the spending end, and make sure you put enough money for maintenance in our budget for next year. Lastly, let me remind you that earlier this fiscal year we had another budget "crisis": we were "behind budget" by $500,000 because we had overspent on missions. This was never fully explained to us, but Mac bragged about how we overspent on missions and poked fun of our finance committee as having "no faith" - again, behind our backs while preaching in North Carolina. Go here to read it and hear Mac in his own words. Maybe our finance committee tried to stand up to Mac because they knew that while Mac was overspending on missions that we had serious needs in our facilities - and Mac's response was to spend it and accuse them of having no faith. I can hear the clippers getting warmed up for this Sunday! 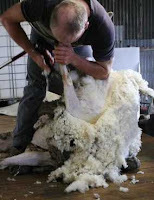 Its going to be one close shave as Mac tries to fleece us all! All together now: "Baaa...baaaa"
"You Used to be Known as a Church that Loves Pastors"
"You Were Known as a Giving Church"
All year long Mac has said giving is strong, and July was the strongest month of giving in the summer in years Mac said. So aren't we STILL known as a giving church? Notice in this clip that Mac challenges us to give to the maintenance needs of the church to prove that we are a giving church. No, we gave the money already, and Mac and the lay leaders have squandered the $15 million and now there is no money left for things that SHOULD have taken priority...but more on that in my next article. Now as you listen to those, some of you will say, "Mac isn't saying you AREN'T these things, just that in past years you WERE known as these things". True...but in this sermon Mac makes no attempt at all to say anything positive about our church NOW...he does what he has told us for 2 1/2 years not to do: dwell on the past and look to the past. That is what he does now, pointing to the past, and cleverly painting a picture of a church that is past its prime. If this isn't disgusting enough, to hear a pastor talk down his church just 2 days before he sends a letter out asking for a million dollars to pay for upkeep of our facilities, believe it or not this sermon got even worse. In this one sermon Mac not only decided to rake us over the coals and tell us how sorry we were, he also chose to motivate us through legalism. Yes, that's right. Mac the historian who loves to talk down "legalistic lists"...Mac the slanderer who told his pastor friends in North Carolina that we were a "hotbed of legalism" behind our backs, that we are a people with lists but "no real relationship with Jesus Christ"....lo and behold Mac passes out his own dose of legalism in an attempt to motivate us to do what we should. Here is what Mac said after indicting his church. "When you joined this church you were making a commitment to do several things. We probably ought to write these things down and give them to everybody who joins [CAN YOU SAY "LEGALISTIC LISTS"?]. There are some things that are expected out of you. There are some things you expect out of the church but I want to tell you something when you join this church you are expected to be a tither [how's that for loving motivation - this is legalism my friends]. Not because I said it but because the word of God teaches that. You say 'I didn't know it'. [ and then threateningly] You know it now. You're expected to be faithful. You ought to be here every service. We have three services a week. Some of ya'll didn't know that did ya? Sunday morning, we'll be back here at 6:10 tonight and Wednesday night. You're expected to pray for one another. That is a ministry you commit to when you join this church....if you prayed for one another you'd like each other better." No mention of love as a motivation. No mention of how we might benefit from church attendance. No mention of giving out a love for the Lord to His church. No allowance for some who can't make it every service. This is classic, old-fashioned, KJV, fundamental legalism. "Everyone of you that knows Jesus Christ as Lord and Savior you have a spiritual gift. You have a stewardship of that gift. And if you come in here and God's given you the gift of singing, of playing, of teaching, of leading, of working with children and all you do is sit on a pew and soak it up, you're sinning against the Holy Spirit. You say 'well that's mighty strong'. Yeah its strong." We didn't say its "mighty strong"....you misheard us Mac, we said its "mighty wrong". There is nowhere in scripture that says a person who just comes to church sits in the services and doesn't serve is "sinning against the Holy Spirit". They might have family problems that keep them from serving. They may be ill. They may have a child with special needs. They may have to work two jobs to make ends meet and can't serve in any capacity but all they can do is come to the church service and worship the Lord (and when they get there to hear an encouraging word from the Lord they hear Mac's anger and legalism). Church, this is dangerous stuff. A man so arrogant, so puffed up that he thinks he can throw this garbage around judging people to be sinning against the Holy Spirit, trying to scare people into serving. I declare if anyone is sinning against the Holy Spirit, it is Mac for preaching this garbage. And to think we're rushing to get Mac to preach out in the southern side of Duval County and northern St. John's county with this mean, legalistic preaching in a satellite campus? And to think we allowed him to use $200,000 of our church funds to spread his legalism on nationwide TV on the INSP network while our babies are put in a leaking, soggy, preschool building in need of repair. All you pastors in southern Duval who might be concerned about the big dog sheep stealing from your church: JUST LOVE YOUR CONGREGATION, PREACH THE WORD AND YOU HAVE NOTHING TO FEAR FROM MAC THE KNIFE. Christians who are under the nurturing care of a loving, humble, faithful pastor will take one listen to Mac's meanness, his legalism, his anger... and they'll be running for the doors. So there you have it. Poor Mac. He is stuck in a backwards looking, non-evangelistic, un-giving, un-loving church. And he chose the Sunday to tell us just two days before he sends us a letter asking us to give a million dollars to upkeep on our facilities that he has let slide for 2 1/2 years while spending money on everything else. "The Letter" will be the next article this weekend. In the last post I gave the quote and audio clip of how Mac Brunson "built a case" against his own church, like an ace prosecuting attorney, in the area of how we are no longer creative in Sunday School. Mac says we're no longer "cutting edge" (whatever that means, as he didn't say), we've lost our "entrepreneuralish in Sunday School" (again, he didn't define this). He says we "nearly had a nervous breakdown" when he asked the Sunday School teachers to do "one thing" (the "one thing" I'm told was a very significant change in certain areas of our church as to how the Sunday School is actually conducted - that we've moved away from the "teacher" model to "small groups"). So Mac pokes a finger once again in the eye of his congregation, telling them in vague terms of how they are not performing, complains that some aren't falling in lockstep with his changes, and doesn't even bother to tell us what he expects to make us "cutting edge" or "entrepreneurial". So is the life of FBC Jax under the regime of Mac Brunson. Negative, negative, negative. "You were known for your evangelism...how 500 people would go out on Tuesday nights from this church. You divided up into zip codes, nobody ever thought of that [news flash: most churches have done that for visitation, large and small ever since zip codes were defined! ]...and we said 'man, what an unbelievable thing, we don't run 50 in church and they've got 500 going out' and you were 'cutting edge', you were knockin' on doors, you were seeing people. Is that not the committment you made when you came to Jesus Christ? [yelling now]. Ye shall be my witnesses! Or they just gonna talk about what you used to do? Are they gonna talk about FBC Jax in ther past tense for the next 30 years? Listen to Mac indict FBC Jax for no longer being evangelistic. "How do we reach people in the year 2007? Now I've had tons of you come to me and say 'Pastor, in the 70's we used to go knock on doors, we'd go knock on doors'. Now you can't ever find anybody at home. Listen, let me tell you something. I'm never at home, you're never at home. I've tried to come see some of you, and I know you're not at home. Nobody else is ever at home. One of the most effective ways we have of reaching the next generation and reaching their parents is through a school." Quite an amazing statement. We're all living in our cars, sleeping in the streets apparently - nobody is ever at home! Knocking on doors doesn't work anymore because no one is home. There are many good reasons to start a school. But because "no one is home anymore" is not one of them. And the school will absolutely NOT be a primary means for reaching the people of Jacksonville. But Mac doesn't tell us what we need to do. He doesn't point out to his listeners who in our highly paid executive staff is the one that is trying to coordinate Tuesday night visitation, or what we all should do since no one is "knocking on doors". No call to specific action. Just tearing down to tell us "we ain't what we used to be". Mac Brunson on Sunday 9/21 "built a case" against his church (his words...as he said again he wanted to be a lawyer) gave a sermon that was chock full of legalism and negativity...it was Mac's attempt I'm sure to be a strong leader, talking directly to the people of the plight they're in. But what is so sad, is that Mac doesn't know the first thing about leadership; leadership is not tearing people down and asking why can't they do better...its casting a positive vision, a call to specific action, calling on the people to muster the strength they have to rally around a shared vision. Mac gives no vision. Instead he seems to enjoy more telling his church how far they've fallen, pointing out their faults, rather than extolling their virtues and casting a POSITIVE vision. and we used to be a giving church. It was very discouraging. Maybe our church has fallen far. If it has, he has to accept some of the blame himself as he's been at the helm for 2 1/2 years. But he doesn't accept any responsibility, in fact he uses the word "you" instead of "we" an awful lot in his lambasting of his congregation. Here is the first of Mac's indictments of the church. "FBC Jacksonville was a church that was innovative in Sunday School. 20-30 years ago you were doing stuff in Sunday School that the [SBC] Sunday School Board hadn't even thought of...you were on the cutting edge...go on and applaud yourselves 'cause I'm 'fixin to 'get ya'. I'm building a case; that's why I wanted to go to law. You used to do cutting edge things in Sunday School. You were out in front. When you mentioned FBC Jacksonville you thought the most creative, the most innovative Sunday School. But let me ask you something. We ask you to do one thing in Sunday School now and you just about have a nervous breakdown. Where's your creativity? Where's your courage? Where's the entrepreneurialship (?) in Sunday School. Where's the 'cutting edge'? [now yelling]. Where did it go. What has happend to us? Why can't we be cutting edge once again in Sunday School?" No positive vision. No call to specific action. What the heck does "entrepreneurialship" mean in Sunday School to the average lay person? What does "cutting edge" mean? What is he asking faithful Sunday School teachers to do that they aren't doing? We have very dedicated people in Sunday School who have devoted their entire lives to teaching people the bible. The truth is there was nothing fancy going on in our Sunday School all these years that Mac is talking about. It was just people who were taught to love the Word of God, taught to love Jesus, and taught to love the people of Jacksonville. That was it. In fact, what Mac the pseudo-historian doesn't understand, is that while other churches were falling all over themselves to be "cutting edge" (whatever that means) back in the 70's and 80's and even '90's, we were just doing the same 'ole thing: loving Jesus, loving the Bible, and loving people. And here's a "good word" for you Mac: whatever things we did in Sunday School that were "cutting edge" - it was the strong, clear, and loving leadership of our pastors and staff that led us there. If we're floundering now, perhaps its more an indication of the failure of your leadership than some moral failing of hundreds of Sunday School workers. But this was just the first of Mac's indictments against our church. It gets worse, and I'll share the other three with you in the coming days. Our church is in bad shape. We need a leader. We need someone to cast a positive vision for all the people, and not someone who wants to tear down as he struts around the stage. NEWS FLASH: Brunson Discovers that Churches in Rome Were All Satellite Churches! Mac Brunson thinks his congregation are a bunch of biblical illiterates. In his sermons recently he has expressed concern over how gullible we are when we read books and watch TV, that we're all being led astray by heretical writers and TV preachers. Here is an example from this past Sunday. So while he likes to beat us up for not being people of the Bible and not bringing our Bibles to church, he also likes to use his perception of our biblical illiteracy to his advantage. Case in point this Sunday, while preaching out of Romans Chapter 1, he declares that the churches in Rome were actually a group of "satellite churches", comparable to what we are doing here in Jacksonville by opening a satellite church in southern Duval County. If he actually believes that there is any similarity between his plan for satellites (a huge mother church starting "branch" churches where a "rock start" preacher drives in to preach and money is collected and sent back to the mother church) and the first century believers in Rome, then he needs to study his bible a little more closely. "There were many churches across the city of Rome. They met wherever they could. There was not just one congregation...people ask...well what about...you know...you've got a downtown location for a church and then you're gonna go and put a satellite out somewhere...well that's exactly what the church in Rome was. It was a group of "satellite churches". That is absolutely ridiculous! If anything, if we were to follow the pattern of the churches in Rome and elsewhere in the New Testament, we would be interested in starting a new church in southern Duval County with their own pastor perhaps, not a millionaire preacher who will drive in his BMW to preach to people live and via video tape at some branch church where all the money and power and control comes back to the "mother church" in downtown. So readers, another example of how careless Mac Brunson is with the truth. His "brand" is one of bible scholar, historian....yet he pulls off a ridiculous statement like this. I've said it before when he fibs in his supposedly historical illustrations, and when he lied to our faces about Sheri Klouda: if he will fib in the pulpit over historical facts and tell lies about former church members, he'll also take liberty with the scriptures. We used to be able to trust the words from the pulpit at FBC Jax, but while Mac is filling the pulpit we all need to be very careful and measure his every claim. There might be many reasons to start a satellite church. None of the reasons have anything to do with the churches in Rome also being satellites. Mac knows it. Every preacher reading this blog around the SBC knows it. But he still puts it out there because he thinks we're biblical illiterates and will believe anything he says. Carpet, Wallpaper, Chillers, and Roof Repairs...Where Did the Money Go? Update: Click here to listen to Mac say that we used to be known as a giving church. His sermon was a classic "sheep beater"...telling us all what our church used to be known as. One of the things we used to be is a giving church. In this clip he says if we want to stay out of debt we'll give the money for these "needs"...although he ignores the fact that he's spent money on non-budgeted expenses already, and he doesn't consider the possibility of cutting operating expenses elsewhere. Are we sure Mac isn't a democrat - he acts like a "tax and spend" liberal. He put the number at $900,000 needed. Like only Mac can do...he doesn't implore people to give out of the goodness of their hearts for a need, doesn't make an explanation as to why a special offering is needed...no, he instead threatens us that we will be going into debt for the first time in 46 years unless we dig deep and give the money. The guy is absolutely shameless. It really is quite an amazing sight to behold. Mac even had pictures for us to show us a picture of the chiller in the mechanical room, and showed us pictures of the carpet and wallpaper. It was so moving, I nearly cried when I saw that poor chiller in the RLA mechanical room - all alone, not providing chilled water. Mac chose to take $500,000 from our church funds during an unannounced Wednesday night special business meeting to fund the school start-up. Was that money in our 2007-2008 budget? Shouldn't maintenance items be paid out of tithes and offerings before money is taken to fund a brand new ministry? Mac took a special offering in April to raise money to put him back on nationwide TV. He never told us if we reached the goal. But we are now spending over $150,000 to put Mac on nationwide TV on INSP network. How much did we have to dip into our budget to pay for Mac to be in INSP again? Mac is encouraging the rich to go with him on a Holy Land trip that is not a church function. He uses our church website to advertise it, and he even mentions it in his sermons. Here's an idea: let's bring Sarah Palin in! She will find the money! Sarah Palin will take an objective, hard-nosed, "bulldog with lipstick" approach to our church finances. She will look at our budget and see where we can cut out the pork. She can start first over in the pastor's office and his support staff consisting of several family members. Then let's go to the church marketing budget and how much money is going to Maurilio Amorim and the A-Group, and how much we pay to fly Maurilio down for creative sessions with Mac at Deerwood and if we can't cut that budget. The, Sarah can look at where the $500,000 is going for this new school and what its being spent on. Then, we need to get to the bottom of Mac's 501(c)3 website and make sure we're not paying the A-Group for that site. Also Sarah, take a look at how much it costs to put Mac on nationwide TV and if there aren't less expensive options for broadcasting our services to the world. And then let's sick Sarah on the Pastor's Conference money - where in the world does all of that registration money go to? Does it at least pay the increased operating expenses incurred by our church, or does it all go to the pockets of the big time preachers who come to speak? I think - no, I KNOW - ole Sarah Palin might find the $900,000 that should be there for the required maintenance of our facilities. Finally, I still don't get it...many of the lay leaders of our church are serious, seasoned businessmen and lawyers and accountants and financial planners and CEOs....men who know how to spot an amateur CEO who has his spending priorities mixed up. Why do they allow Mac to do this? Do they really think the congregation is as stupid as Mac thinks we are? He teaches legalistic tithing, then he can't manage the church's budget to pay for maintenance items - he takes money out for non-budgeted projects then comes for a special offering to pay for operating expenses at our church. We can't even pay for Muslim bibles out of the budget, so it takes a special offering. Can our church leadership perhaps make a decision: what is the criteria for what is a special offering? So FBC Jacksonville faithful members..don't fall for it. Don't give money to this special offering for the maintenance of the church - if you're giving consistently to the church budget - YOU ALREADY HAVE GIVEN THE MONEY FOR THESE REPAIRS. MAC HAS SPENT IT ON THINGS OTHER THAN WHAT IT SHOULD BE SPENT ON. One last suggestion for Mac: perhaps you can seed the fund by taking a home equity loan out and giving the $300,000 given to you by J.D. Collins when you first arrived, and then maybe the church can borrow $300,000 back from the $500,000 we gave for the start-up of the school, and we're 2/3 of the way to our $900,000! This week we were once again treated to another explanation from Mac about how poorly he was treated when he got here to Jax. Yes, according to Mac it was "terrifying" and like being "on trial". Unbelievable. I've never heard a pastor continually tell his congregation how terrible they are, how unloving they are, and how poorly they have treated their own pastor - like Mac does. He did it in July and now again. And when one examines the facts, its just a bold faced lie. Its revisionist history from a supposed historian. He wants sympathy I suppose; I can't figure out why else he engages in this nonsense. "When we [Mac and Debbie] came here...do you know how terrifying it is to walk in and be pastor of a church? In a place...not unless you're a pastor do you even understand what I'm saying. You walk into a place, you know nobody, you're on trial, people immediately begin to point out your flaws. 'I don't like this', 'Why did he do that? ', 'Why did he preach out of that Bible? ', 'Why did he say that? ', 'Why did he say this'?, 'Why does he dress like that?....the least thing we can do, the LEAST thing we can do is to hold back judgement and express love"
The above statement comes just before the invitation, after a sermon where he is telling his congregation that their gifts of the spirit are useless unless they have the fruit of the Spirit, which is love. - his comment is absolute rubbish, and anyone who was here the first 6 months of Mac's tenure knows it. Any pastor, of any church, is going to have detractors. Mac knows that. All preachers know that. Especially the new guy. Make no mistake, the church was 99% behind Mac Brunson when he came here. Sure, there were people who didn't like him using the NASB instead of the KJV (I myself didn't care). But he was loved by the people when he came. We trusted that our search committee, hand picked by Jerry Vines, had selected the right man for the job. We were behind Mac Brunson. Those that were here when he preached in view of a call know it, and Mac and Honey know it...and for sure the search committee and lay leadership of our church know it more than anyone. Besides, true leaders lead...they don't complain about their detractors, they don't lash out at their criticizers...they just, well, they just lead. (see also "George Bush"). So Mac, shut up about how tough it is or was. Take the money you're given, live the high life in Deerwood, and just cry on your closest friends' shoulders like Paige Patterson and Maurilio Amorim about the abuse you've had to endure. And if possible, leave open the possiblity that whatever abuse you feel you've had to endure may have been your own doing. - Why must one be a pastor to know what he is talking about? Would he please get over the idea that being a pastor is the loftiest, most responsible, weighty position in the world? Why does he continually say that we can't understand how tough he has it? A person in a position of leadership, even in a business organization knows that he will be second-guessed, he will be mis-read, and people will be skeptical - even moreso in the secular world than in a church where a good number of the people worship the pastor. These megachurch pastors are given six-figure salaries, wonderful benefits, have grown men kissing their ring finger and telling them how great they are and how the preacher is "God's man"....and in Mac's case: we built him a $100,000 personal office suite for wife and secretary and dogs before he came using the most prime space on our entire campus...a member gave him free rent at a multi-million dollar ocean-front condo for he and his family until their million dollar mansion was built...his wife and son were put on staff...and he was given a 2-month long paid vacation before he ever showed up to start his job, and we allowed him to bring his own church marketing consultant with him from Day 1. We paid big money to promote Mac on Father's Day 2006 by holding a service at our minor league ballpark: "Sermon on the Mound" we called it (should have been "sermonette on the mound"). Now you tell me...does that sound so "terrifying"...does that sound like he was "on trial" when he came here? Come on Mac, you lose more and more credibility every time you try to poor-mouth us about how tough you have or had it! - Mac's statement is consistent with his view of our church ever since he came here, and it explains why he treats us as he does. I wrote last year about how Paige Patterson told the student body at SWBTS that Mac was under attack ever since he came to our church by "recalcitrants", and likened his treatment by FBC Jax as wanting to "kill" Mac Brunson. Mac is a liar. He lied about his treatment at our church to Paige Patterson. He then slandered us to the pastors in North Carolina earlier this year that we are a "hotbed of legalism". He lied in the FBC Jax pulpit about Sheri Klouda, a former church member of his at FBC Dallas and he will not apologize. Mac Brunson and Debbie Brunson were treated like king and queen when they came...and yes, when you draw a $300,000 dollar salary, and you run an organization as big as our church, you're going to have a very small percentage of the people give you a hard time - it comes with the territory and with the large salary. Ask Jerry Vines. - Mac makes no attempt to try to understand his congregation. He only wants to be understood, but doesn't want to understand us. If he doesn't feel enough love, than we are an unloving congregation. If he feels there are people not happy with his leadership style or direction because they are sending him questioning emails, then the congregation is a bunch of complainers. Its never possible in his mind that the problem is with HIM. Its always the congregation. A pastoral transition can be difficult for a congregation, and the first year or so was very tough. And to see him come in and start taking liberties with our church with jobs for family, unannounced absences from the pulpit, complaining how we are stuck in the past, yelling at us because not enough people volunteered to pray with the pastor...all of this is tough on us too. But in Mac's mind, like many of the big names in the SBC that he's buddies with - if there's a problem in a megachurch, its the people and never the preacher's fault. - His view of the congregation as treating him poorly, and being complainers and stuck in the past and unloving toward people...is how he in general views congregations I'm convinced. Mac wrote a book "Why Churches Die"...and the book is basically a thorough examination of all the possible ways a church congregation or church members can screw up a church. In fact the introduction of the book is entitled "Church Would be Easy Without People". So Mac, everybody knows you were treated well when you came. And they know now, through this blog, why you're having difficulty leading FBC Jax. Its not the congregation, sir. Its you. Take a long look at yourself Mac before you look down your pious nose at us. If you were a truthful, discerning man, you would lavish praise on your congregation for how they are treating you, and how they treated you when you came and you would lead us in love and not in harshness and demanding our followship. But you can't do it. You must desire us all to line up and kiss your ring and follow you in lockstep and never question your authority, else in your book we're mistreating you. Mac Doesn't Like Councilman Referring to "Sorry Churches"
A couple of things very interesting about Mac's comments. Be sure to read my previous column to understand what prompted Mac to mention this certain "city council member". - Why did Mac feel the need to condescendingly mention Davis' comments about sorry churches? Must be Councilman Davis stepped on Mac's toes and Mac feels that his church, FBC Jacksonville, is one of the "sorry churches" Davis referred to that are not doing their job in this city to help the needy but instead are falling all over themselves to send missionaries all over the world and build magnificent structures instead of helping the poor in their own city. - Mac's reference to Davis' comments doesn't even fit the context of Mac's remarks about his constitutional freedom to speak out on issues. Davis' comment had absolutely ZERO to do with preachers' rights to speak freely on public issues. Davis said that if "sorry churches" would make ministry to the down and out in our city a priority then the local government wouldn't have to spend so much tax payer money. Sounds reasonable to me. Does Mac take issue with that? Of course not, because Mac already said that churches should "rise up" and do hurricane relief and not the federal government and Mac is already on the record as praying that the government doesn't get involved if we get hit by a hurricane. But Mac is a blowhard...he likes to say anything that will get the crowd riled up. - Notice the response of the congregation and the hootin' and hollerin' after Mac makes his remark. Can you say "gullible sheep"? - Interesting that Mac doesn't like the councilman being critical of the churches in this city. Readers I ask you, which is worse? A councilman in a city council meeting, in his hometown, calling for churches to do their job and minister to the poor...or a pastor, a PASTOR, traveling out of town and calling his church and possibly the entire city "a hotbed of legalism" where "everybody has a list of rules but no real relationship with Jesus Christ?" Yes, that's what Mac said about his own church and city last March. Click here to listen! Only unlike Davis, Mac said it behind our backs to preachers in North Carolina, and unlike Davis, Mac doesn't have the backbone to explain his comments, not even to his own church. Davis has given interviews and has explained his comments. How 'bout you Mac? Are we here in Jacksonville all just a bunch of legalists with no real relationship with Jesus Christ? No wonder you had to bring Maurilio in from Nashville to help you decide what to do at our church, we're all a bunch of legalistic dolts down here in Jacksonville! - Mac gave a glowing explanation Sunday morning of what a "hypocrite" is from the Greek text. Well, Sunday night Mac's reference to the councilman gave a very nice real life picture of what a hypocrite is, and no Greek text was needed...its Mac condescendingly mentioning Davis' remarks which were intended to spur churches to get more involved in meeting social ills, while Mac himself takes six-figure gifts from our church members to enrich himself and takes half a million from the church operating budget to start a school that only the very rich will be able to afford, and Mac uses our church website to encourage members to go on expensive Holy Land trips. What is Mac doing to help in our city? Well, when Mac was called on to sit on the mayor's crime prevention steering committee with Nat Glover (former sheriff), Wayne Weaver (owner of the Jags), John Delaney (former mayor and president of UNF) and other prominent leaders in our city....Mac could find the time in his busy pastor schedule to attend only 2 of 7 meetings! Now he's poking fun of the councilman's comments, and the gullible sheep hoot and holler about it! So Councilman Daniel Davis, keep speaking out on this issue, but don't hold your breath waiting for FBC Jax and Mac Brunson - their plate is full: millions to start a school for the very rich, need millions in campus renovations, need workers not to help the poor but to start a satellite church in southern Duval county so Mac can preach via satellite, and we need money for Mac's nationwide sermons. But when a real need arises like hurricane relief, Mac will have the ushers hold buckets at the exit after Sunday for us to throw some change in - which is what Mac did on Sunday. Maybe some money from our church budget should go to hurricane relief, and we should hold buckets at the exits to pay for Maurilio's consulting time, Mac's nationwide sermon broadcasts, and for the new school. By the way readers, Bob Allen at Ethics Daily has a more detailed story out today on Davis' comments that you can read here. On a side note: I wanted to let my readers hear a quote from one of our younger ministers who spoke in the Sunday evening service on the topic of illegal immigration during a forum Mac had on current events. According to this minister, a Christian worldview says we should not seal up our borders, but we should welcome all illegals since they are all "souls", and instead of closing up the border we should evangelize it and be happy that so many are coming to our country so that we can get them saved. Maybe churches should be handing out tracts to the illegals coming across the border? Listen to the remarks yourself here. After this minister spoke I heard Mac utter "that's a good word" as the young minister sat down. No Mac, that was a bad word. We need to, for security reasons, to do a better job of controlling who comes into our country. Once they're here, yes, minister to their needs...if any money is left after paying the pastor and wife, the school, the satellite churches, and the campus renovations...or we could collect change in buckets to help the illegals. Click here to read an article written by Ron Littlepage of the Florida Times Union, about one of Jacksonville's city councilmen who proclaimed in a city council meeting recently that it is because of Jacksonville's "sorry churches" that government money must be spent to give underprivileged kids scholarships to the Don Brewer Early Learning Center. The city government has been seeking private funding of the center to avoid spending hundreds of thousands of tax payer dollars to keep it open. The councilman's name is Daniel Davis (picture at right) - and he said government will have to step up and help fund the center because of "sorry churches" in our city who don't "fulfill their mission", and are instead "building magnificent structures" and "tripping all over themselves to witness in foreign countries" but not doing what they should at home. I'll lump FBC Jax in with the "sorry churches"...and I think reporters like Ron Littlepage and city councilmen like Daniel Davis don't even realize the extent to which what Davis says IS true. Millions of dollars, TAX EXEMPT dollars...are spent on things like huge pastor and pastor wife salaries enabling them to live in exclusive neighborhoods and drive fancy cars and put their son on staff, spending money on 3000 square foot lavish pastor office suites for pastor and wife and dogs...all while neighborhoods just up the road are in need of the love of God and the resources of God's people. OK, let's assume that FBC Jax needs to spend its $15 million budget primarily on buildings, salaries, and overseas missions. Where are the efforts to reach people in the poorer, crime-ridden areas of Jacksonville? The pastor is hot and heavy to broadcast video of his sermons in a branch church in southern Duval. He and Jim Smyrl are trying to convince hundreds of families to give up their Sunday nights to start home churches to evangelize their neighborhoods in southern Jacksonville so that next spring they can be used to start a satellite church in the wealthiest part of our county...but what if he used his influence to start a tutoring program for underprivileged kids like he told us over a year ago? What portion of our 15 million dollar budget is being used to help the poor and down and out in our city? Not much, not much at all. And I realize this didn't start with Brunson. However, his actions since coming just make it all the worse - spending money on projects that don't help the needy, BUT ALSO are not even in step with the mission and scope of our church! This is why the news of our pastor accepting a $300,000 land gift from one of our richest members just three weeks after arriving here is so troubling - that certainly didn't help the needy in our community or further our church's mission. To accept such a gift so early in his tenure here in our city just sends a terrible message to the people of our city that we're all about enriching a man instead of helping God's people. Or that our pastor earns a $300k plus income along with his wife being on staff and we used $100k and 3000 square feet in our children's building to construct a lavish office suite for pastor and wife and dogs. Didn't someone ask "how does this office suite further the gospel or help those in need?" We gullible sheep sit and watch as the pastor uses our church resources like his own source of project capital - taking $500k out of our church budget (not special gifts...OUT OF OUR MINISTRY BUDGET) to start a school in the fall of 2009 that will benefit only a very few in our congregation that can afford tuition to the tune of $8000 per kid...holding a special offering on Resurrection Day to collect $150,000 to put himself back on national TV...using our church website to market "Holy Land" trips to the very wealthy in our church...all things that might, MIGHT be worthwhile activities...but they don't help many people in our community and they are not within the mission statement of our church. So dig deep people of FBC Jax that have been told you must tithe to experience God's blessings...because FBC Jax needs hundreds of thousands every week...you are the revenue source to keep it going. But not to worry, Mac "Jeremiah Wright" Brunson is praying that the federal government doesn't come here if a hurricane hits us, and he is "praising Jesus" that you all didn't get a raise last year because you're all so stupid you'd just use it to get further in debt. Mac's hurricane relief comment just shows what a blow-hard he is...if he thinks the church should "rise up", then why isn't he leading the charge? Keep calling out the "sorry churches" Daniel Davis. But the only way these pastors and lay leaders will be held accountable is when God's people stop forking over 10% of their income while they carelessly watch the pastor and lay leaders spend it on the pastor and his family and on projects inconsistent with the mission of the church. Maybe we need a "Sarah Palin"...someone to come in and stop the wasteful spending and hold "the good ole boy network" at our church accountable for the abuses at our church under Brunson.